In support of NASA’s MESSENGER spacecraft mission to the planet Mercury, the National Center for Earth and Space Science Education created and oversees the MESSENGER Educator Fellowship Program. Since 2004, the MESSENGER Fellows – master science teachers selected from across the U.S. – have trained nearly 26,000 grade K-12 teachers on Solar System content, including training on the Voyage K-12 Curriculum. The Fellows also use the lessons with their own students. In the photo above, MESSENGER Fellow Walter Charuba’s class is laying out a one to 10-billion scale model of the Solar System as part of the Grade 5-8 Voyage of Discovery lesson. 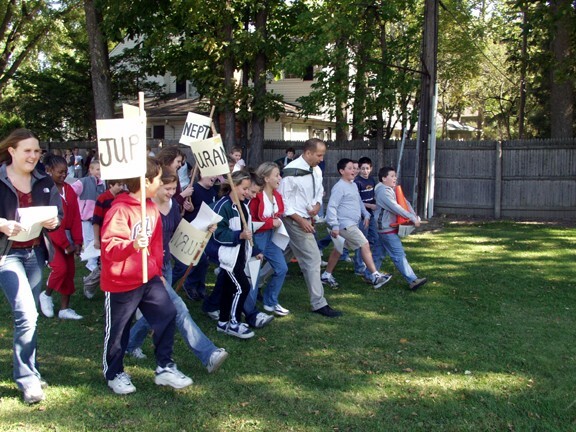 The class is seen heading into the outer Solar System (you can tell because the Jupiter flag hasn’t been planted yet.) Walter is a teacher at Brownell Middle School in Grosse Pointe Farms, Michigan.